I saw this art project the other day and had to investigate. A boring stretch of road in the South Park neighborhood had all of a sudden turned into bright, festive swaths of pavement. I was driving over vibrant floral patterns and fresh, eye-catching designs—but why? And by who? 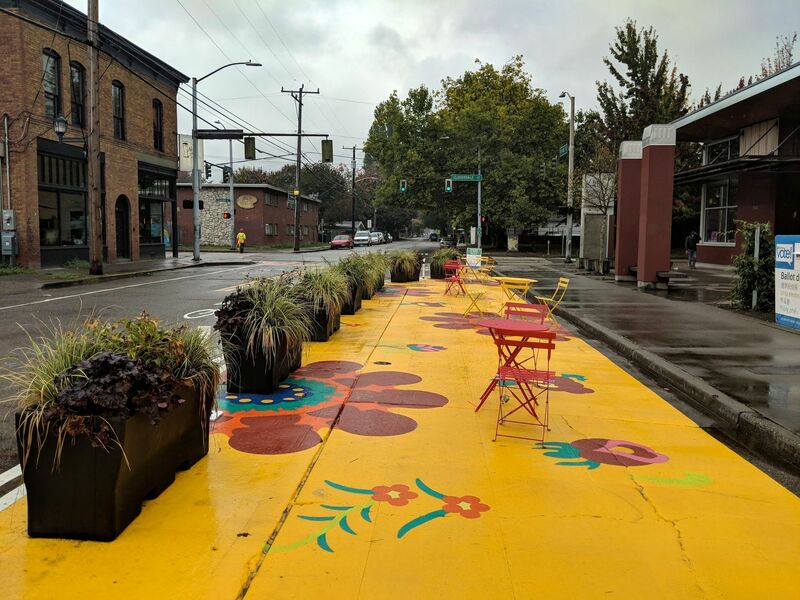 Turns out, it’s Pavement to Parks, an SDOT project that takes little-used stretches of road and turns them into colorful asphalt parks. This one in particular is in South Park, a not-so popular Seattle neighborhood (read: more affordable), on Eighth Ave. S and Cloverdale Street, right outside the South Park Library. This project celebrates El Día de los Muertos, also known as Day of the Dead. It comprises a crosswalk, a no-car zone in front of the library, and an intersection. Simple stuff, right? But wait until you see it in person. Instead of those utilitarian, white crosswalk marks, South Park now has a flame-colored flowers and a Day-of-the-Dead style mask (Iike The Great Gatsby’s eyes of Doctor T. J. Eckleburg). The intersection now has life and individuality, and the no-car zone has become a useful space—not just a dead no-man’s-land. The bright colors of the no-car zone have chairs, tables, and plants. I kept looking into this project, and it gets better. This El Día de los Muertos design was chosen by South Park voters. The local community got to choose from 22 designs, and they selected this one. It’s democracy at the local level; it’s individuals getting to beautify their neighborhood the way they want. But paint on a road can’t last long, right? We see road painting happening all the time. 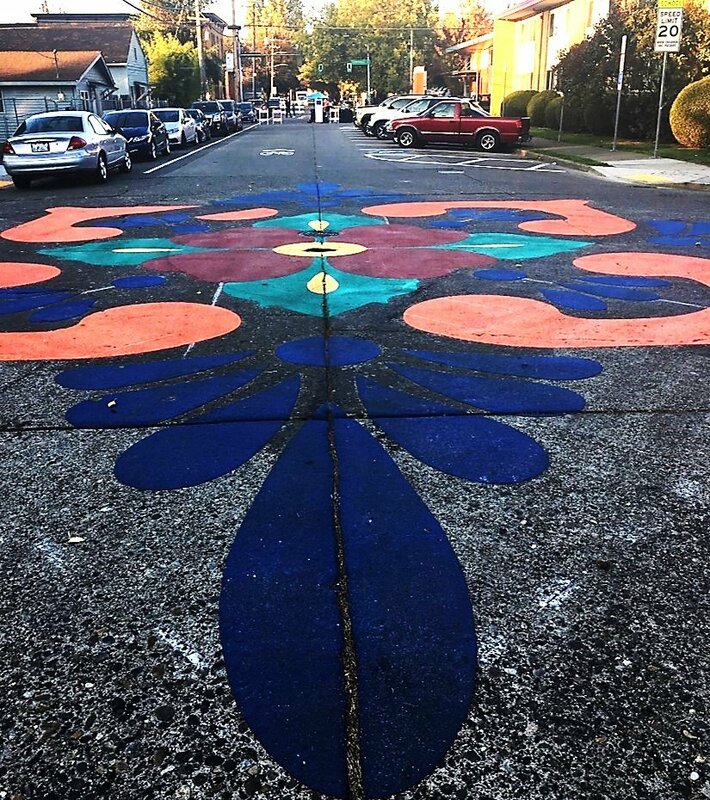 Most Pavement to Parks projects last two to three years, but this one was made with thermoplastic, so its lifespan should stretch up to a decade. Compared to race pace the rest of Seattle has been running at lately, I’d call a decade semi-permanent. I’m so glad I drove past this the other day. It’s beautiful, and it celebrates multiculturalism, and it gave the people a voice. It makes the neighborhood feel like a real community—a place that’s unique, a place that locals take pride in, and most importantly, a place where a community spends time together.